The APA'6 Publication Manual of the American Psychological Association (http://www.apa.org) should be used as the publication style for the articles. The submitted article should be either in English or Turkish. The abstract of the articles should be between 120 and 250 words. The title of the article should be short and should not exceed 15 words. 3 to 5 keywords need to be included. If the article is in Turkish, an extended summary in English consisting of 600 - 1000 words and five main topics (Purpose, Method, Results, Discussion and Conclusion) should be included before the main text. There is no necessity for short and extended Turkish summary if the article is in English. The article should not exceed 10.000 words (not including abstract and extended summary if it is in Turkish). The problem sentence should be indicated clearly in the Introduction section. 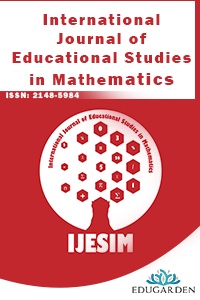 The articles are required to be prepared according to the IJESIM_Template_ENG and uploaded to the system without the author's name and address on the article itself. The article’s plagiarism report must be submitted by the corresponding author through the platform to the editör, before uploading final version of the article.